You are currently browsing the tag archive for the ‘Wax Week’ tag. Every year I hear from students who want to take my encaustic workshops but live too far away to fly in for just one or two days. With them in mind I offer my Wax Week class, a 5-day intensive workshop that combines some of my most popular classes with some brand new techniques that will keep you creating new work for years to come. Subjects include creating beautiful backgrounds before you wax, working creatively and safely with shellac, mixing different media within one painting, secrets of creating depth, pouring wax for an ultra smooth finish, and taking your painting from start to finish. All levels are welcome. Subjects include mixing different media within one painting, creating transfers with photographs, drawings and rubbings, texture and embossing, secrets of creating depth and taking your painting from start to finish. All levels are welcome. Most supplies will be provided including wax, paint, brushes, paper, boards, and basic encaustic tools. Space is limited to 6 students and classes fill quickly. I hope to see you soon. More detailed information, photos and registration here! * Those of you coming in October will get an extra bonus: The timing on this class is perfect to also attend Portland Open Studios on Oct. 10 – 11. You can choose from almost 100 art studios to visit including some of my favorite Portland painters who work in encaustic. Don’t miss this! So that’s it for another Wax Week! I only do these 5 day intensive classes once or twice a year and it’s always exciting for me to watch such an enthusiastic community of artists bound by wax. I usually have students from several states and this session was no different except that several of them could claim many states as their home since they happened to be in transition. No matter, everyone came with an open mind, an open heart and kind words for their fellow artists. A bird theme seemed to appear pretty quickly! This is by Sandy. Shannon’s texture tools getting a workout! It’s safe to say that Shannon especially loved adding texture! Shannon is back to work on image transfers. What a change in mood! A toast to end a wonderful week! Thanks Sandy, Mary, Shannon, Dorothy and Leslie for an exciting week. New techniques learned, exciting art created and new friendships formed. I love to see everyone swapping contact info before they leave. I can’t wait to see what you come up with next! I’m planning my Wax Week dates for 2015 now! If you’re interested in joining us please sign up for my free newsletter to be notified when dates are finalized. I hope to see you in Portland soon! 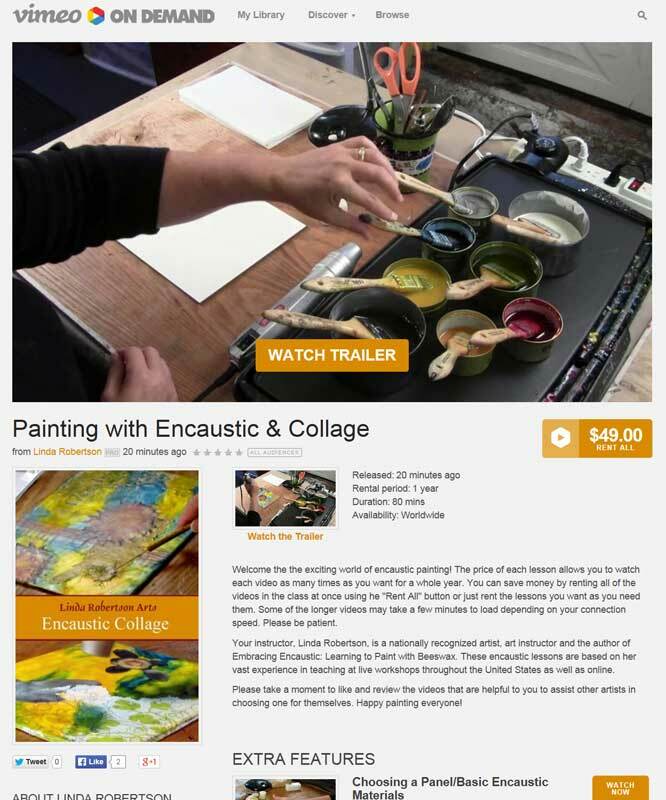 Linda Robertson offers live encaustic workshops in her Portland, Oregon studio as well as online encaustic classes at RobertsonWorkshops.com. 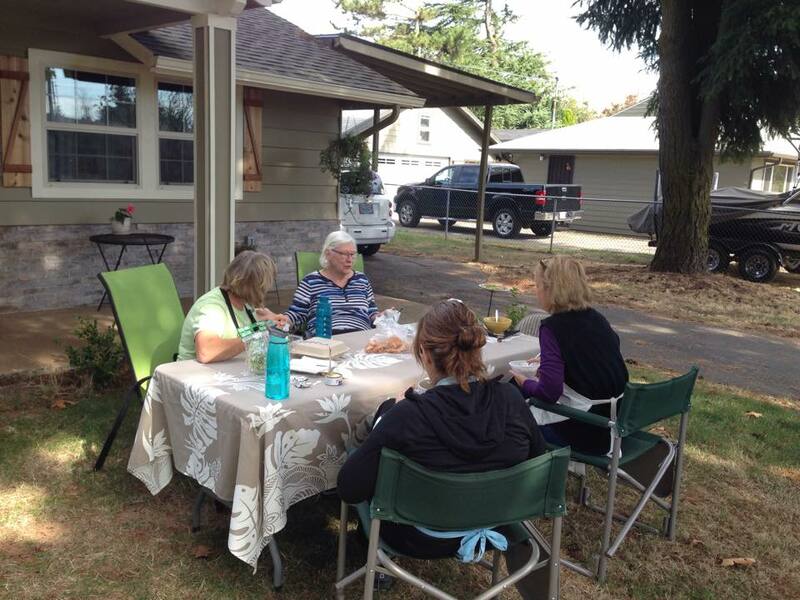 Last week I hosted a 5-day Wax Week Mixed Media workshop in my Portland, Oregon studio. I usually travel across the country offering this workshop at schools like Idyllwild Arts in California and Arrowmont School of Arts & Crafts in Tennessee, but I needed some time off from all the packing and unpacking so I invited students to come visit me this year. Students from Washington, California, Colorado and Texas joined in the fun working with encaustic paint, paper, pastels, stamps, pigment sticks, inks, encaustic monotypes, wax scrolls and more! Here are a few photographs from the June session. If you missed this Wax Week class you have another chance in August when the weather in Portland will be spectacular for a visit. Come join us!